Q. How many times have you crashed your road bike? A. I have lost count! As a kid I raced BMX and crashing is just part of the sport. I picked up road riding as a teen in hopes that I wouldn’t crash as much and so far so good. On the road bike I have had a few good crashes with some road rash scars to prove it. Check out: Have you crashed yet? I did. Q. 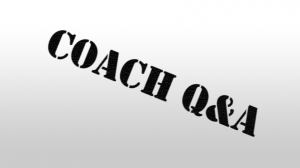 How much does it cost to hire a coach? A. Depends on what you are trying to accomplish as a cyclist. I have ready made and custom plans that start at 35.00. I also have virtual and traditional coaching that start at 45.00 a month. What you need to ask yourself is how much help do you need and how much accountability you need to have to be successful in reaching your goals. If you are a recreational rider who is looking for a place to start a ready made plan or even a custom one maybe just what you need. If you are a competitive cyclists just getting started or have been racing a few years I would suggest you go with virtual or traditional coaching. Q. How do I increase leg speed for cycling? A. Like any training it needs to be specific to the goal you are trying to reach. If you set a goal to icrease your cadence you need to do intervals that allow for more speed than your goal and the recovery to allow for the adaptations to be made. Try things like spin ups and super spins to increase you cadence or even just increase your cadence for 10 minutes of each group ride you do for the next several weeks. Super Spins are usually done on the trainer in super light gearing where you spin super fast for 10 revolutions of the crank followed by 2-4 minutes of easy pedaling before beginning the next interval. Spin Ups are simmillar in that use light to moderate gearing but instead of all out mayhem you build up to your fastest candence with out bouncing in the saddle for 30 seconds followed by 2-4 minutes of easy by 2-4 minutes of easy pedaling before beginning the next interval. So how many of these intervals should you be doing? Ah this is the magic that coaches bring to the equation. It depends on several factors such as experience, age, training phase and event schedules. Q. How do I train for attacks in races? A. Just like the above question training needs to be specific to the goal you are trying to reach. Just going out and riding “hard” miles will not allow your body to make the necessary adaptations to attack or to hold on to an attack in a race. Attacking is made up 4 very specific training factors, Speed, Muscle Endurance, Anaerobic Endurance and Power. So if attacking is weakness your training will need to include workouts that address the 2-3 of the 4 training factors mentioned above that you would consider yourself the most weak at. Check out: What to do in a bike race – Attack, attack, attack! Q. What can happen if you don’t train correctly? A. This is a really subjective question and I wasn’t going to answer it but I thought something could be learned by exploring it. First what is correct training? To me as a coach it means the following specificity, timing and goals. I wouldn’t have someone who is only going race bikes out running or have a duathlete who is concerned with pacing doing a lot of sprinting. When do you need to peak for your priority event? If your peak event is in a week I would not apply alot of volume to your schedule. What are you trying to accomplish in this season? If your goals are to finish your first race or event training will be different from those who have been cycling a while and have learned there strengths and weaknesses. So what could be the worse case scenario from not training correctly? The most common would overuse injuries, burn out, wrecks cause by fatigue and inexperience. Q. What do I do when a team mate is in the break? A. Thinking about race tactics is fun, executing team tactics is like playing chess at 30MPH. Typically when a teammate is in the break and it appears to be a strong break you need to get to the front of the peleton and set a pace that can keep your teammate in the break. This is sometimes called blocking or setting a false pace. Basically you want the peleton to do just enough work that they think they are making ground on the break. Q. Is mitochondria a banned substance? Q. How do I race in the heat? A. This is a great time of the year to be asking this question as most of the US has been plunged into excessive heat warnings. Here is an article I wrote on racing and training in the heat, one from the Cycling360 Podcast and one from our partner at Apex Nutrition. Q. What are the secrets to cycling further? A. I am going to take this question on at face value. To ride further than you normally do you simply increase your mileage to no more than 15% a week. I would also recommend that you reduce volume overall every 3rd week. Doing so allows your body to recuperate and make the adaptations you need for riding comfortably at longer distances. These and more questions get answered here and on facebook. If you have questions you can email me at Rob@PositivePerformanceCoaching.com, or DM me at twitter and leave me message on facebook. Until next time have a great ride!